Each year, I look back at the paintings which were made a century earlier. This time, this is rather special, as 1918 was the year in which the Great War, as it was known then, ended, and in which so many who survived its slaughter died in the following influenza pandemic. This article looks at some of the paintings made in 1918 which depict the war and its effects. The German artist Lovis Corinth had been an enthusiastic supporter of the German Empire. 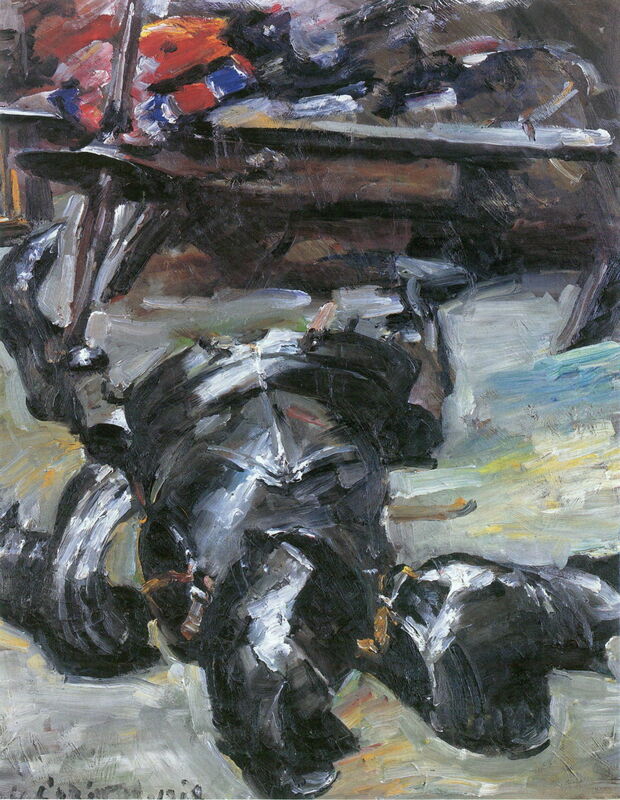 He became progressively disenchanted during the war, and at its end expressed his feelings symbolically in Armour Parts in the Studio, with its empty suit of armour broken apart, and cast on the floor. 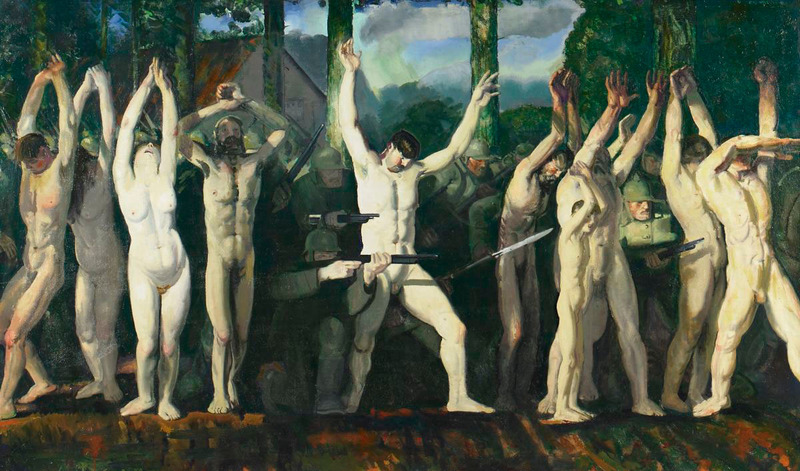 George Bellows had strongly opposed US entry into the war, and was horrified by the many stories of atrocities allegedly committed by German troops when they had entered Belgium. One, in which the Germans had apparently used the local population as a ‘human shield’, he expressed in The Barricade. Henry Tonks, a former consultant surgeon before he became a full-time painter, was commissioned as a Lieutenant in the Royal Army Medical Corps in 1916. But it wasn’t until 1918 that he became an official war artist. For much of the final phase of the war, John Singer Sargent and Tonks travelled and worked alongside one another. 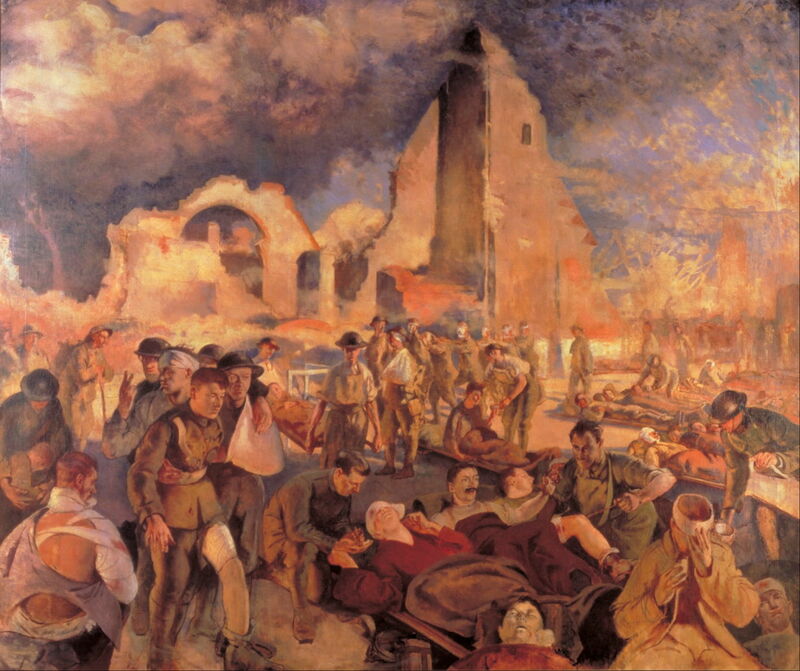 Henry Tonks (1862-1937), An Underground Casualty Clearing Station, Arras (1918), media and dimensions not known, The Imperial War Museum, London. Wikimedia Commons. Here, Tonks shows a cellar being used to receive and assess the wounded in An Underground Casualty Clearing Station, Arras. Henry Tonks (1862-1937), An Advanced Dressing Station in France, 1918 (1918), oil, 182.8 x 218.4 cm, The Imperial War Museum, London. Wikimedia Commons. 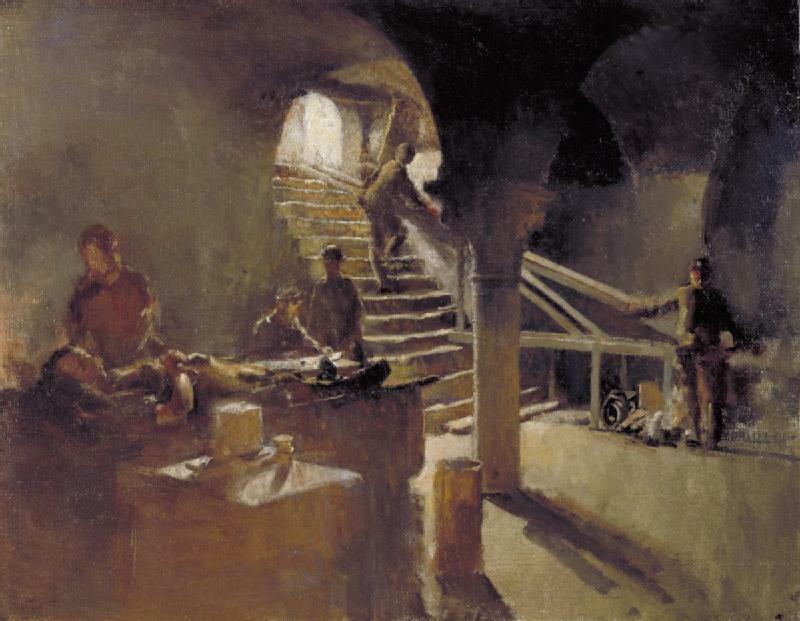 Perhaps Tonks’ most important painting is that of An Advanced Dressing Station in France, 1918, a near-documentary depiction of an ad hoc medical facility not far from the front line, and the apocalyptic vision of war. 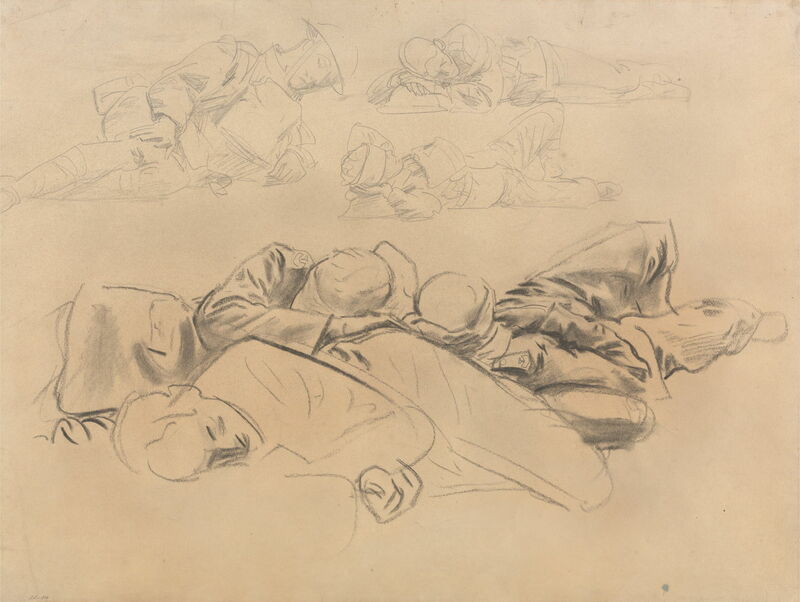 John Singer Sargent (1856–1925), Study for Gassed Soldiers (1918), charcoal and graphite on cream wove paper laid down on card, 47 × 61.6 cm, Yale Center for British Art, New Haven, CT. Wikimedia Commons. John Singer Sargent made a series of drawings and studies for his commissioned work Gassed (1919). 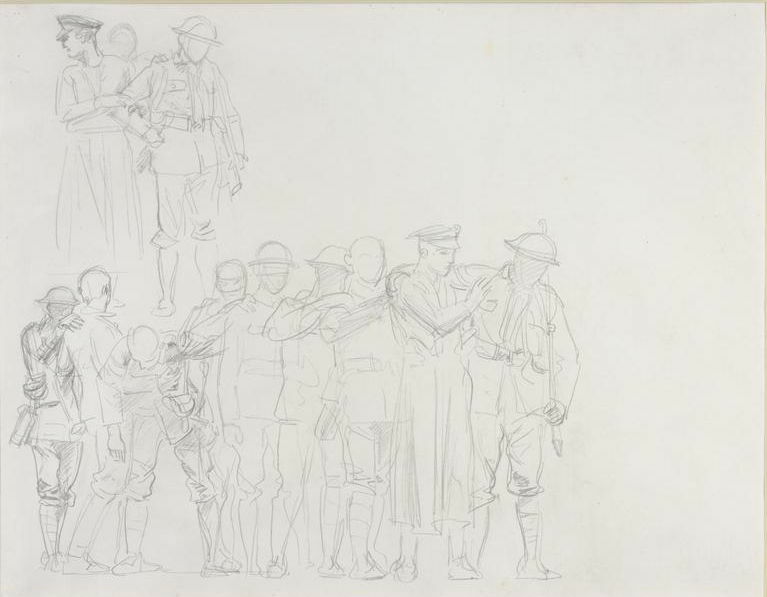 This Study for Gassed Soldiers show details of different passages for the final painting, and could have been made in Arras or Fulham, London. More interesting, perhaps, are Sargent’s assemblies of figures, such as Study for ‘Gassed’. 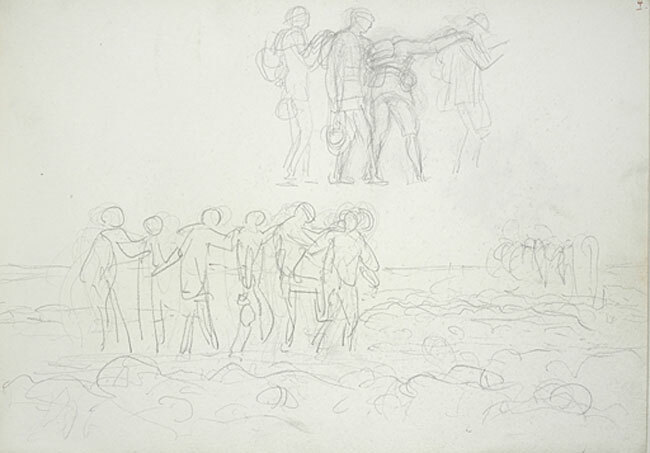 John Singer Sargent (1856–1925), Two Studies for “Gassed” (1918), graphite on paper, 64.5 × 93.5 cm, Fogg Art Museum, Harvard University, Cambridge, MA. Wikimedia Commons. The Two Studies for “Gassed” in the Fogg Museum are more compositional in purpose, and show the shape of the final painting starting to emerge. John Singer Sargent (1856-1925), Interior of a Hospital Tent (1918), watercolour over pencil on paper, 39.4 x 52.7 cm, Imperial War Museums, London. The Athenaeum. 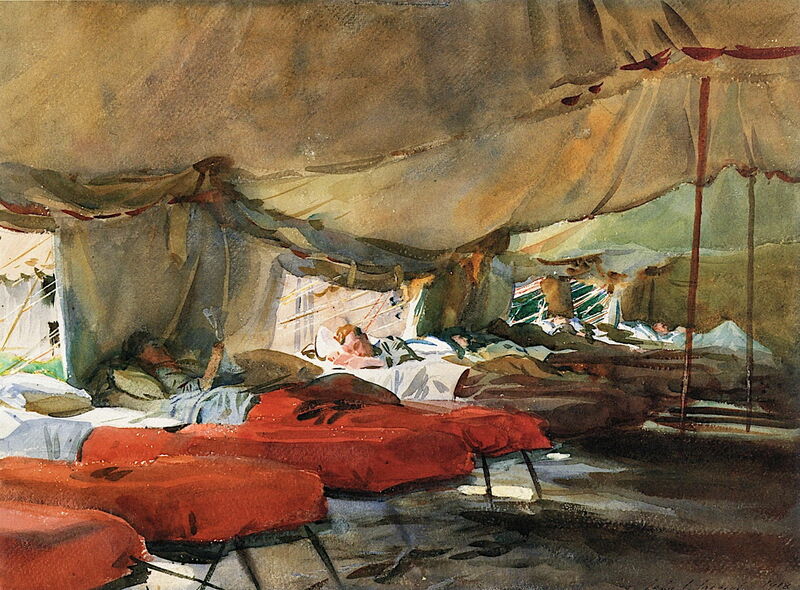 Sargent painted several other scenes in military medical facilities, including this watercolour of the Interior of a Hospital Tent. John Singer Sargent (1856—1925), Crashed Aeroplane (1918), further details not known. Wikimedia Commons. One of the most famous paintings of aviation during the war is John Singer Sargent’s Crashed Aeroplane. 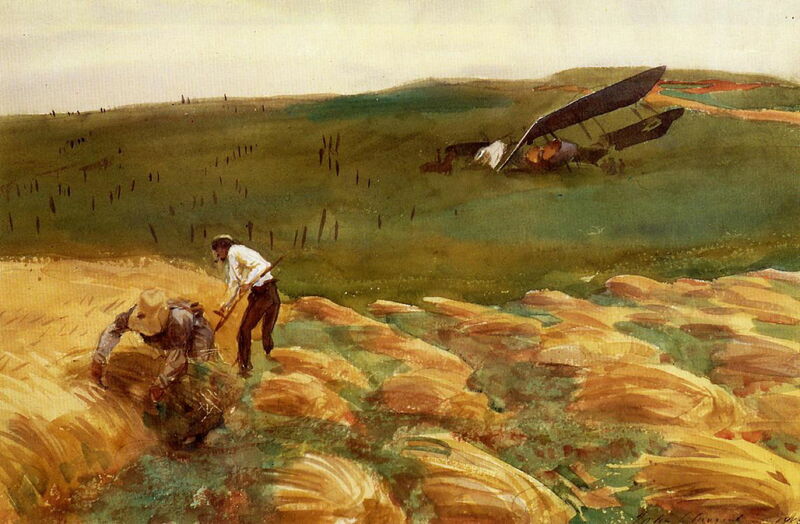 Two farmers get on with the harvest, with a crashed British biplane planted in a hillside behind. The First World War introduced war at a different level: in the air, high above the soldiers in their mud, barbed wire, and trenches. Louis Weirter (1873-1932), An Aerial Fight (1918), media and dimensions not known, The Imperial War Museum, London. Courtesy of The Imperial War Museum (IWM ART 654), via Wikimedia Commons. 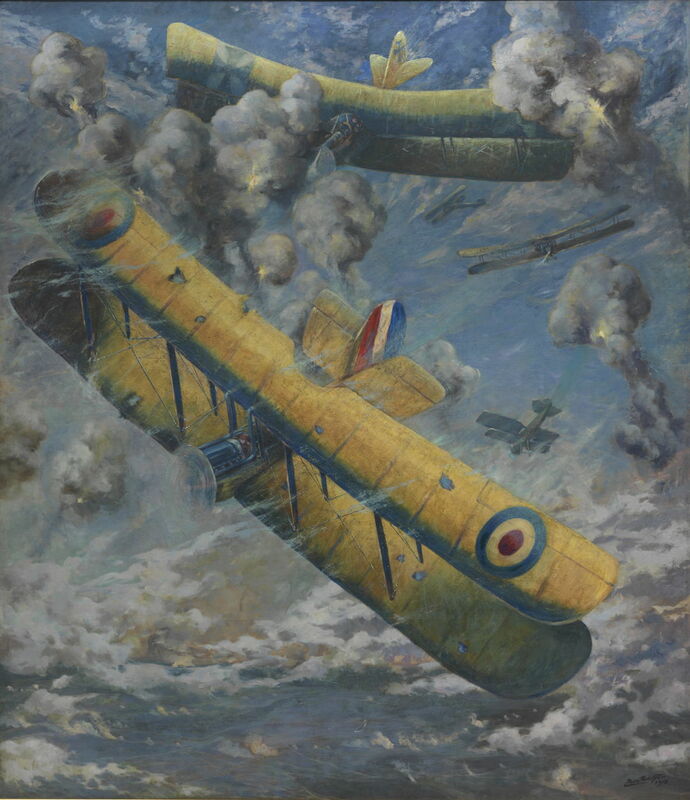 Louis Weirter’s An Aerial Fight is one of the first paintings showing the war in the air, as British and German biplanes fight among scruffy clouds. 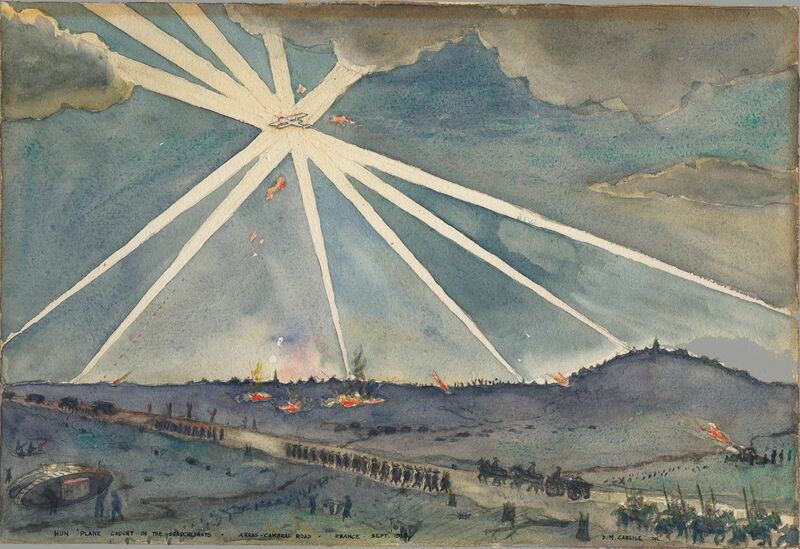 David M Carlile (dates not known), Hun Plane Caught in Searchlights – Arras-Cambrai Road – France – Sept 1918 (1918), watercolour on paper over card, 21.6 x 29.8 cm, Canadian War Museum, Ottawa, ON. Wikimedia Commons. David M Carlile’s Hun Plane Caught in Searchlights – Arras-Cambrai Road – France – Sept 1918 is an atmospheric watercolour showing a scene from the final months of the war. 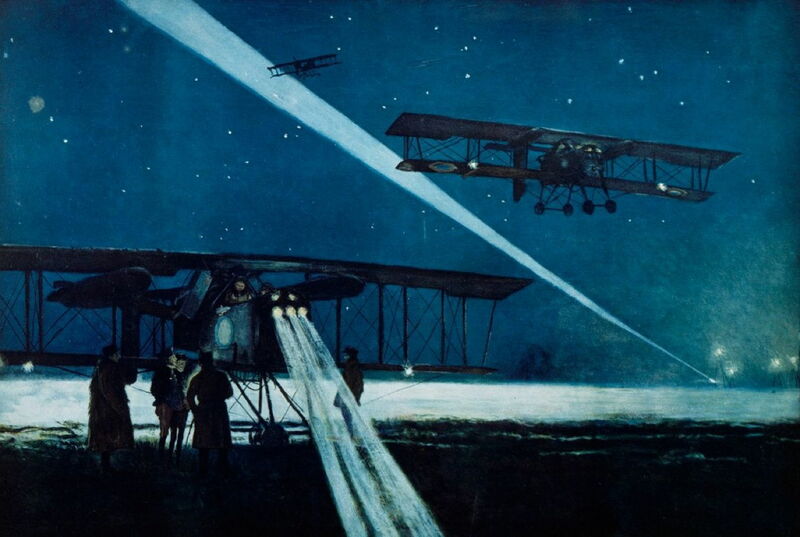 François Flameng’s superb watercolour of Return of a Night Bombing Flight of Voisin Aircraft is perhaps one of the best paintings of the war in the air. Flameng was a very successful portraitist, and a close friend of both John Singer Sargent and Paul Helleu. 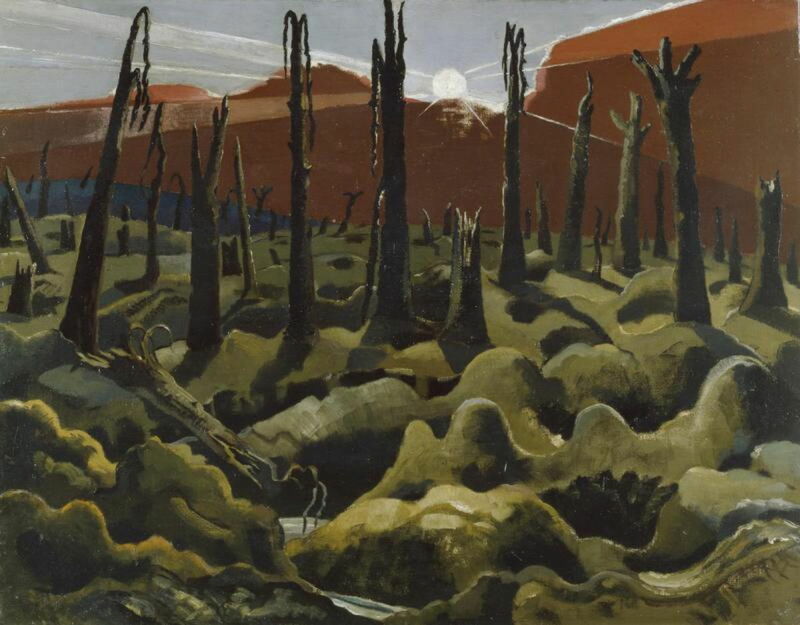 Paul Nash proved one of the most prolific war artists of 1918, and I find his original approach evocative and deeply moving. Typical of the paintings made by Paul Nash of the Western Front is this watercolour Wire, which had originally been titled Wire – The Hindenburg Line. It shows a characteristically deserted and devastated landscape, pockmarked with shell-holes, and festooned with wire fencing and barbed wire. Its only landmarks are the shattered stumps of what was once pleasant pastoral land. 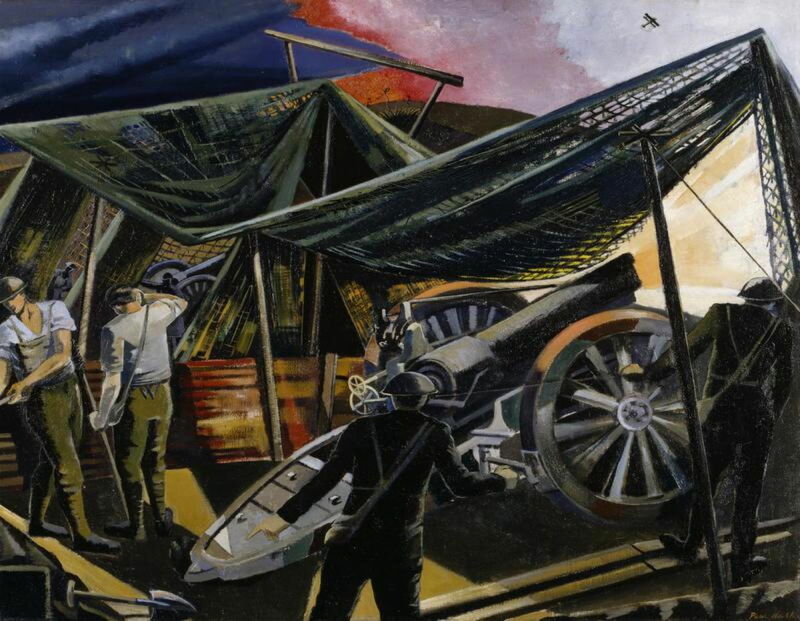 A Howitzer Firing is one of Nash’s early oil paintings, and was commissioned by the Ministry of Information. It shows a four-man British guncrew working under a canopy of camouflage netting. In the sky, flying high above the flash of exploding shells, is a biplane. Behind this howitzer is another in the same battery, pounding away during the barrage. Nash’s lithograph of Men Marching at Night shows a strong design influence, drawn from Blake and amplified by the regularity of military life. 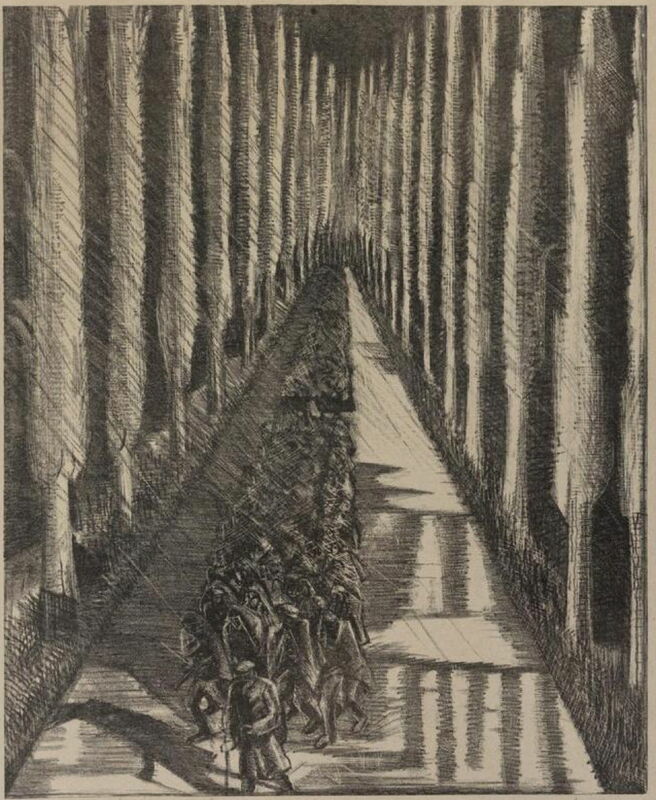 The long column of tight-packed soldiers is seen moving along an avenue of poplar trees, lit by an unseen full moon. 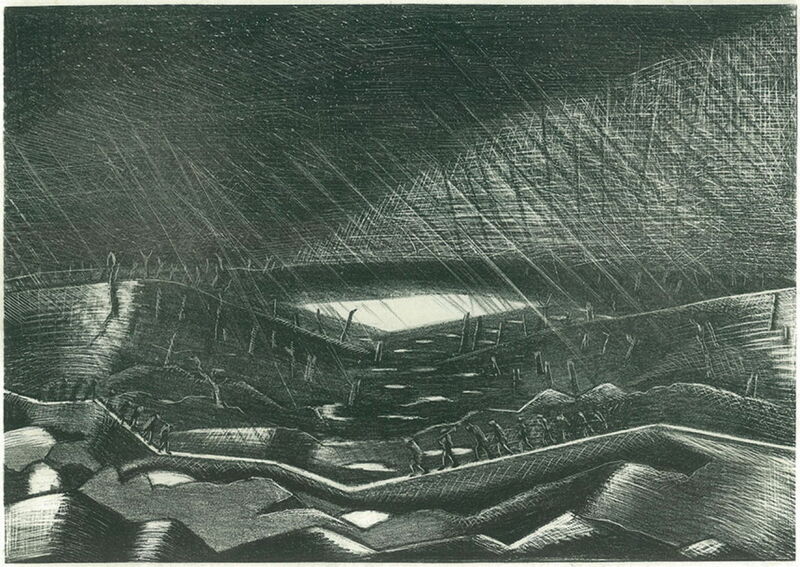 CRW Nevinson, another notable British war artist, helped Nash learn the process of lithography at this time. Rain, Lake Zillebeke is a lithograph which Nash made from a drawing of soldiers walking along duckboards zig-zagging over the mud. Again it shows design influence, with the treestumps and flooded shell-holes arrayed in patterns. Not all of Nash’s paintings from the front line were as bleak and stark. 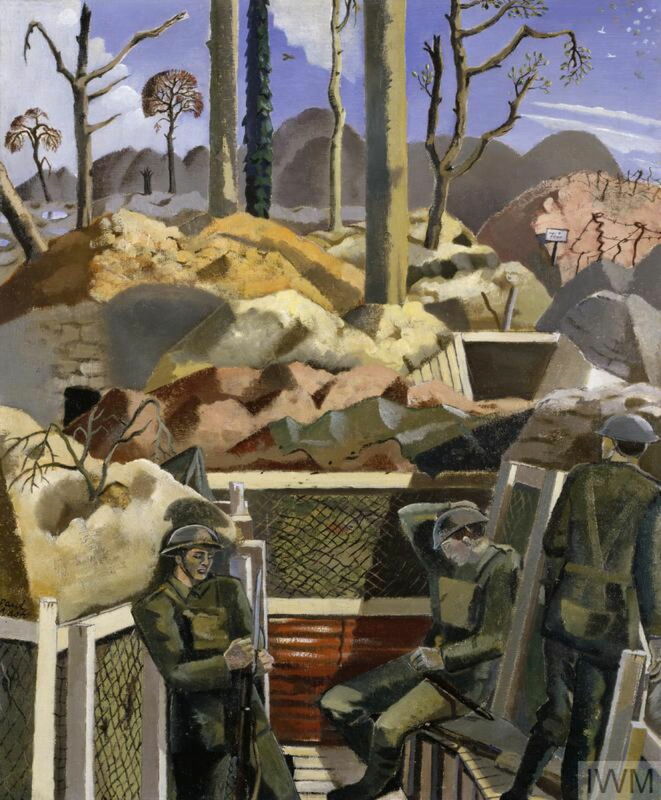 Spring in the Trenches, Ridge Wood, 1917 is based on drawings which he made slightly earlier. Some of the trees in the distance still have branches and foliage on them, and the three soldiers appear idle. 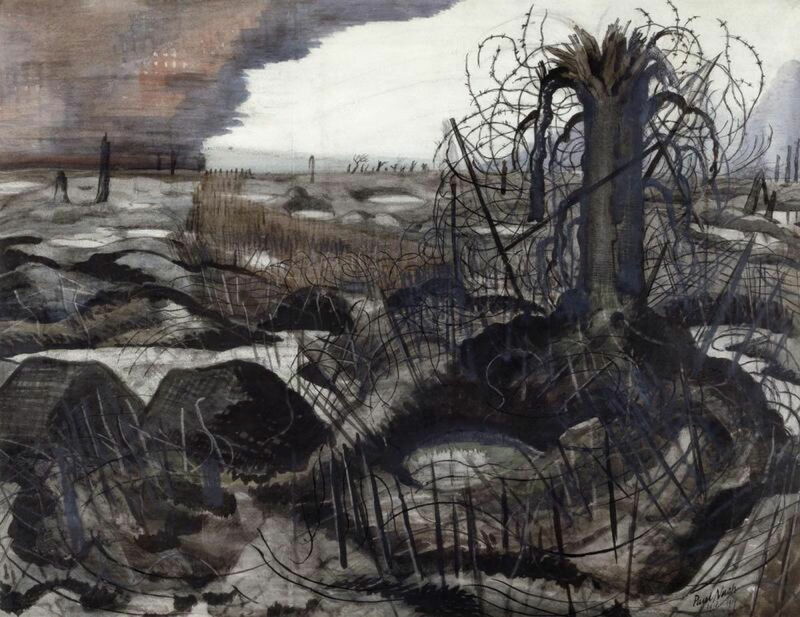 Nash’s pen and ink drawing of Sunrise: Inverness Copse, showing the aftermath of heavy fighting during the Battle of Langemarck, became this finished oil painting of We are Making a New World. Although richer in colour, the slime green furrowed mud dominates the lower half of the canvas. Its intensely ironic title and use of the early morning sun makes the artist’s response to the war very clear, and it has remained one of the strongest images of that war. Albin Egger-Lienz (1868–1926), Finale (1918), oil on canvas, 140 x 227 cm, Leopold Museum (Die Sammlung Leopold), Vienna, Austria. Wikimedia Commons. 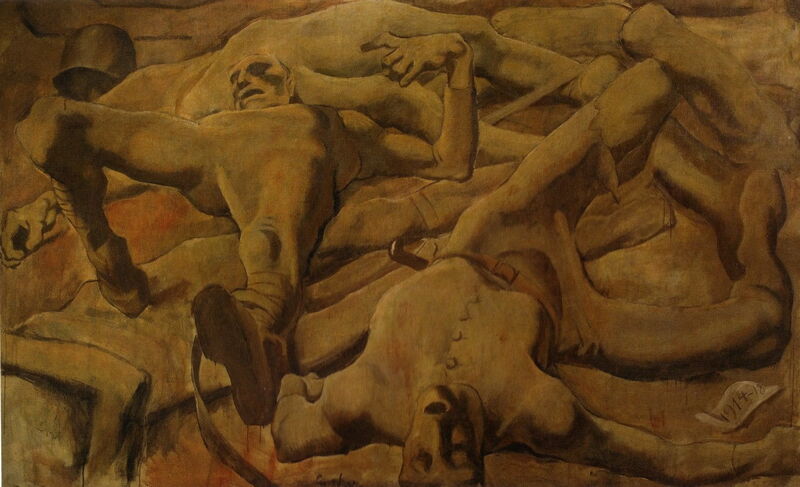 But for my eye, the last image should be one of Albin Egger-Lienz’s more provocative paintings: Finale, with its pile of mangled and contorted bodies in a trench. Next week I will show more paintings which were completed a hundred years ago. Posted in General, Life, Painting and tagged Bellows, Carlile, Corinth, Egger-Lienz, Flameng, landscape, Nash, painting, Sargent, Tonks, war, war artist, Weirter. Bookmark the permalink. I have a photo taken in August 1916 in Pozières, France, where my grandfather was fighting, that looks just like “We are making a new world”. Thank you – yes, it’s scary, but so many of those paintings are quite accurate. It must have been horrific to fight in.